made with the Lush ‘Space Girl‘ scent. This year, Snow Fairy’s not the only fairy in town! Get glam with your gothic self by gliding our brand new shimmer bar wherever you want beautifully iridescent sparkles on your skin. Hydrating illipe and cupuacu butters soften you up while a fruity perfume of bergamot and grapefruit oils lifts your spirits. She might look a bit spooky, but this fairy’s a real softy at heart. Melt between your hands or directly onto your body where you want to add some sparkle. Once the color is on, gently blend in with your hands for flawless coverage. 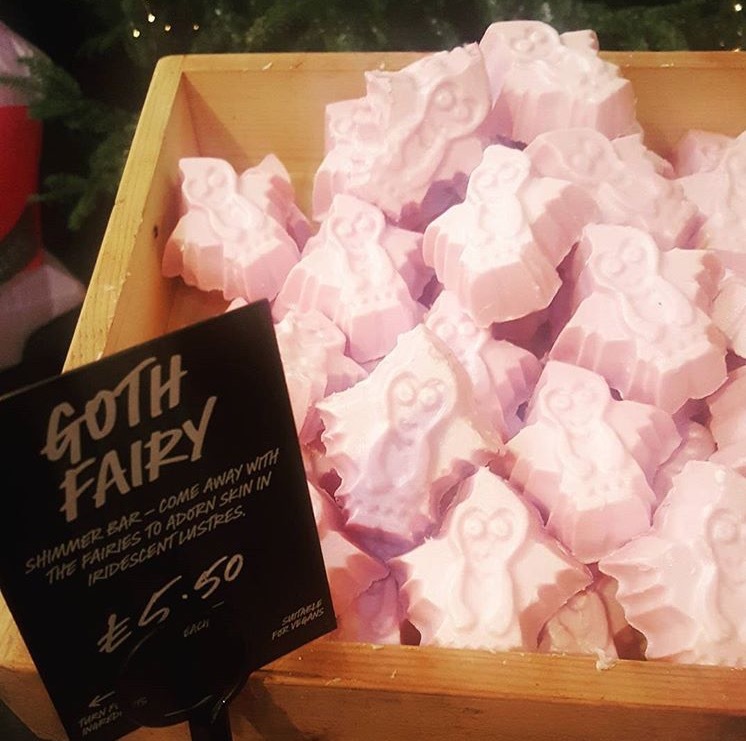 Posted on September 17, 2016 by Lushalot	• This entry was posted in Halloween 2016 and tagged lush halloween, slush goth fairy sparkle bar. Bookmark the permalink.